This cute angel rabbit plays on a musical note. 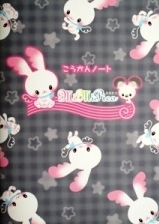 The cute rabbit, MiMiPico, looks a little adult-like with the dark blue and gray. It is the image of a "piano lesson." These rabbit angels love music. They have fun passing time by singing, performing, and dancing. They play various musical instruments! A friend of MiMiPico. "Pianissimo" is a music term meaning "very soft." The name is fitting for this little, cute mouse fairy. Mimi (耳) means "ear" or "ears" in Japanese. 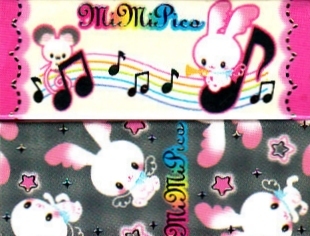 The "mimi" used here could be referring to ears, since this character is about music, or perhaps it could just be the European girls name. "Pico" could be derived from the Italian word "piccolo," meaning "small."